Op-Ed: After Marikana Commission - what now? Op-Ed: After Marikana Commission – what now? The Marikana Commission of Inquiry has drawn to a close. Its final report will be submitted to the president by the end of March next year. Whatever the report says, the facts are not now in serious dispute. But we have yet to begin to reflect on the wider importance of Marikana. The strike, turned protest, turned massacre has called out sensitive and important features of the post-Apartheid political settlement. By STUART WILSON. First the facts. In August 2012, a group of Rock Drill Operators, dissatisfied with their wages, and with the representation available from either of the labour unions with a presence at the Lonmin Marikana Shaft, embarked upon an unprotected strike to push Lonmin for higher wages. The strike, and its attendant protest, soon gained widespread support, and incited a violent response – both from union officials and the police. In the days before 16 August 2012, the striking miners, union officials, Lonmin security guards, and the police themselves, all took a small number of casualties. The striking miners – about 3,000 of them – retreated to the top of a small rocky outcrop just outside the Lonmin shaft compound. There they stayed for four days, demanding that Lonmin management come and address them on their demands. The official response was marked by panic and incomprehension. Documents disclosed before the Commission show that communications between government officials, Ministers and senior Lonmin executives were remarkably ill-informed. The accepted wisdom was that the Association of Mineworkers and Construction Union (AMCU) – the minority union at the time – was behind the strike, and that only AMCU could stop it. We now know that this was not true, although it should have been obvious at the time. When Joseph Matunjwa – AMCU’s President – attempted, at the request of the police, to convince the striking miners to disperse, they simply repeated the demand that they had made all along, that Lonmin come and address them directly. Lonmin did not come. Instead, the police moved to what they called the “tactical phase” of their operations. They encircled the outcrop with barbed wire, and made to disperse the crowd and arrest the striking miners. As they did so, a group of the miners started to descend the hill, moving toward the Nkaneng informal settlement a few hundred metres away. Travelling slowly at first, they sped up, and raised blankets over their heads, as they were met with teargas and rubber bullets fired to their left flank and to the rear. What happened then was televised the world over. Driven towards the police line, the miners ran around a kraal in order to disperse into Nkaneng through a small gap in the police line. As they approached, the police opened fire. This was Scene 1. Seventeen of the miners were killed there. Other miners ran away, and sheltered behind a small collection of boulders a couple of hundred metres away. The police gave chase and fired into, and from the top of, the boulders. Another seventeen miners were killed. At the Commission, this is known as Scene 2. The police claim that they fired in self-defence at Scene 1. They have never provided a clear or complete explanation for their conduct at Scene 2. But few can reasonably doubt that the killings were unlawful. Even if it is accepted that the police genuinely thought that they were under attack at Scene 1 (it should not be), their response – a storm of semi-automatic fire at head and chest height – was grossly disproportionate. The killings at Scene 2 – mostly at close quarters, of miners who circumstances suggest were trying to surrender – were without any justification. The responsible officers should be prosecuted, as almost all of the parties to the Commission urge. These are the facts. But what about the context in which they arose? I want to suggest that Marikana poses five difficult questions about key features of our political order. The first of these questions is about corporatism. Corporatism, as a political system, relies on institutional co-operation between the state, business and organised labour. The lynchpin of corporatist politics is adequate representation. Individuals and groups that are not organised, or whose forms of organisation lack official recognition, are excluded from the corporatist pact. In South Africa, organised labour is the province of the formally employed. More than this, however, organised labour has, over the 20 years since the end of Apartheid, come to represent an ever more privileged segment of the labour force. South African unemployment runs somewhere between 28% and 40%, depending on the definition one adopts. Many more people work in casual employment, or in un-unionised industries. Accordingly, the extent to which ordinary workers can realistically be said to be represented in corporatist institutions has always been limited, and is diminishing. At Lonmin, the strikers, were not, of course, wholly without union representation. Many were members of the National Union of Mineworkers (NUM), whose status as the “majority” union at Lonmin gave it privileged negotiating rights. Some had joined AMCU, which had far fewer such rights. Others had no union membership at all. However, it was the strikers’ election to press their claims outside the unions that was significant. It turned what might have been an unremarkable labour dispute, perhaps easily resolved, into a far wider conflict about the nature of the industrial relations regime at Lonmin, the structures of representation it relied on, and, by extension, the efficacy of post-Apartheid corporatist arrangements. The state’s response was to side with Lonmin, and its alliance partner NUM. It denounced the strike as “illegal” and deployed the police to respond to what it openly characterised as a criminal act. This stance enabled the build-up of heavily-armed security forces which was a necessary precondition of the massacre. All of this calls into question both the efficacy and legitimacy of post-Apartheid corporatist arrangements. If to reject these arrangements, and to seek to organise and engage outside them, is to make oneself vulnerable to criminalisation and police violence, then hard questions need to be asked about whether they are morally acceptable, broadly consistent with political rights enshrined in the Constitution, or politically efficacious. A second problem is the nature of political “participation”. Although often celebrated, without qualification, as a political good, the emphasis on participatory democracy in post-Apartheid politics and law has its limitations. To emphasise participation is necessarily to discourage dissent against political institutions. To the striking miners at Marikana, to participate in the existing structures of collective bargaining and labour dispute resolution was to acquiesce in a system in which they had lost faith. This rejection of “participation” took them beyond the mechanisms through which their political agency could be assimilated and dispersed, which is why Lonmin and the state were so threatened by it. “Participation” presupposes an existing network of processes and institutions in which to participate. This entails accepting a set of power relationships which can be influenced, sometimes transformed, through participation, but will always tend towards a particular set of interests – usually the interests of those who set the system of participation up in the first place. Outside labour relations, ward committees – local level statutorily recognised instruments of local government – are often held up as the key mechanism of participation in the decisions taken by local government – decisions about who gets public works programme jobs, housing, access to water, sanitation and electricity, and who has the right to stay in a particular informal settlement. Attempts to organise outside ward committees often meet with violent reprisals. Abahlali baseMjondolo, a shack-dwellers’ movement based in Durban and Cape Town, has found itself subjected to a progamme of political assassinations, police violence, and violent eviction. At least two of the settlements in which it is active have been renamed “Marikana”. Abahlali is the target of violence not simply because it calls out the state’s abject failure to respond adequately to the needs of people living in informal settlements, but because it does so outside the processes and institutions of “participation”, and because it refuses to allow those process and institutions to channel and dissipate its grievances. It is therefore necessary to ask whether post-Apartheid politics really permits extra-institutional dissent at all. If it does not (and I would argue that Marikana reveals that the costs of dissent are very high indeed), then the value of participation is itself questionable, because participation is only meaningful if it is an active choice to shape the terms of social and political engagement, rather than a reluctant obeisance to the existing distribution of political power. Third, there is inequality. The fissures in our political system might not be so serious were it not for South Africa’s worsening and deep-seated structural inequality. Although absolute poverty has been reduced since 1994, inequality has increased. In any case, about half of the population is living at or below the poverty line. At the core of inequality is the state’s failure to imagine, much less implement, an economic alternative that is capable of making any dent in inequality. As Hein Marais has argued, in his path-breaking Limits To Change: The Political Economy of Transition, and as Brazil, India, Korea and Indonesia have all shown, economic alternatives that protect and grow labour-intensive secondary and tertiary industries are possible. However, South Africa remains a model of economic orthodoxy – a low growth, low inflation, high interest rate, high unemployment economy, which is over-reliant on agriculture and extractive industry. Beyond this, we must also consider the increasing prominence of legal resolutions to political disputes. The law is a powerful political resource. But reliance on juridical processes will not in itself bring about the kind of transformation we need. Juridical forms – like Commissions of Inquiry – have their uses. The construction of the body of evidence generated by the Marikana Commission was clearly valuable. Whatever its report ultimately says, many of the facts the Commission unearthed speak for themselves. But the Commission had its limitations. Its habit of approaching its task like a trial court saw it dawdle for over a year, made it astonishingly expensive and provided few opportunities for the families of the deceased to obtain the kind of victim-centered restorative justice the Commission said it was aiming to provide. Finally, there are important lessons for civil society. Civil society organisations must recognise the limits of their political role, lest, in claiming to speak “for” the poor, rather than “with” them, they replicate the kind of “exclusion by representation” felt by the miners who rejected their unions at Marikana. Dissent, in the form of political action initiated outside formal institutions by formations of the poor themselves, is the most vital source of social transformation in contemporary South Africa. Civil society must expand and protect the spaces in which the poor can act for themselves – spaces like that so brutally shut down at Marikana. Poor peoples’ movements do not need to be interpreted, represented or mobilised by civil society organisations. They can do that on their own. What they do need is strategic support to amplify their voices in a way that disrupts the complacency which has settled over the post-Apartheid political class. 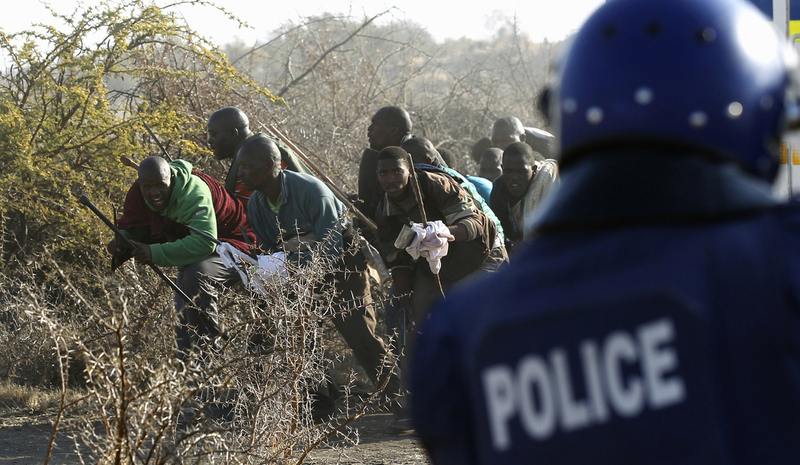 Marikana teaches us that to “represent” the poor; or to encourage them to “participate” on terms other than those chosen for themselves, is often to replicate the kind of political deficits that have led to their exclusion from so many of the benefits of post-Apartheid constitutional democracy.